Lancaster City boss Phil Brown has challenged his players to take things to the next level in a bid to stay at the sharp end of the table. The high-flying Dolly Blues slipped up with a 1-0 defeat at Ramsbottom United on Tuesday night as they missed the chance to go top of the pile in the Evo-Stik First Division North. City, third in the table with games in hand on the sides around them, dominated for long periods but came away with nothing, something which Brown doesn’t want to see a repeat of at Tadcaster Albion on Saturday. “We need to go to the next level and make sure we’re not getting beaten by teams lower down the division,” he said. “If we’ve got aspirations of reaching the play-offs or going top of the league then we need to be getting something against the sides that are 13th, 14th and 15th. “That’s the challenge to the players now. “I think Tuesday night was one of those and Saturday will be another. “Having said that, they are all tough games. Brown’s men found out just that at Ramsbottom with Ryan Salmon’s goal the difference between the sides. “Tuesday night was a strange one,” he said. “After conceding the early goal, which was a poor one to concede, we dominated, we just didn’t get the goal like we did on Saturday. “The performance in the main was there, I’m just disappointed with the outcome. The Blues had needed just the one goal to see off Hyde United 1-0 at Giant Axe on Saturday, a performance that although not particularly flashy, more than satisfied Brown. “It was a professional performance,” he said. “We created plenty of chances, took one and then managed the game well. “We weren’t lucky at all, we more than deserved the three points. 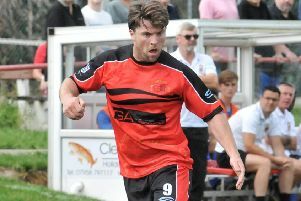 Lancaster continue to be without main attacking threat Jordan Connerton, the striker set for a Christmas return after minor knee surgery. Brown has backed his side to pick up points without him, despite managing just the one goal in the last two games. “We are missing Jordan Connerton at the moment but I wouldn’t say that’s the reason for us just scoring the one on Saturday and not scoring on Tuesday,” he said. “Time will tell, Jordan’s looking like he’ll be back around Christmas. “We need to just take a little bit more responsibility in the box and have a bit more belief that we’re going to get on the end of a cross or get a tap in. Charlie Waters missed out on Tuesday night with a knee problem while Ben Hudson was ill. Both will be assessed ahead of the trip to Tadcaster. Danny Shearwood returned to action at Ramsbottom having missed a couple of months after damaging ankle ligaments. Dylan Davidson has returned to Preston North End after his work experience loan ended.